DTAC was contracted by FDC Construction for the recently completed ISPT George Place redevelopment project. The project unites three buildings in the heart of Sydney’s CBD: 345 and 363 George Street and the heritage-listed 24 York Street. The striking transformation of this impressive super lobby unites ground floor levels of the three buildings with the vision to create a unique precinct that offers meeting spaces, quiet zones, social hubs, food offerings and bars. George Place combines indigenous artwork, premium quality furnishings, natural materials and lighting to provide a welcoming and dynamic environment for work and leisure. DTAC’s renowned elegant and compliant products made it the obvious choice to compliment the project’s remarkable design and particular hues. To achieve this, DTAC supplied and installed approximately 48 square metres of their DT0300 Brass Tactiles across the site at various locations such as stair landings and the base of escalators. This product has been tested to AS/NZS 1428.4.1 to achieve an R12 slip resistance rating, giving the builder peace-of-mind. If you have any questions in relation to the DTAC range, DTAC is ready and able to assist you in getting it right. We can help interpret and apply the relevant standards and codes and design, manufacture and install solutions to your project requirements. 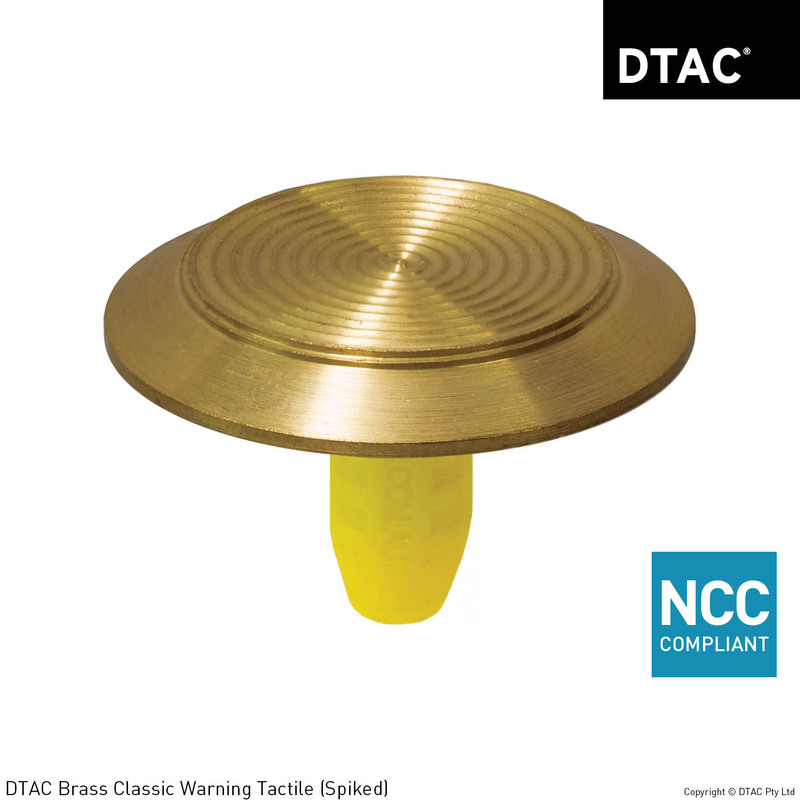 DTAC Classic Brass Warning Tactiles combine a high quality finish with high slip resistance properties. Manufactured from solid brass it features a concentric circle design on the horizontal face with a smooth outer edge.